At its roots, the Yuletide season is a religious holiday, so it is only appropriate that wishes and messages relating to it have some sort of acknowledgement of such. 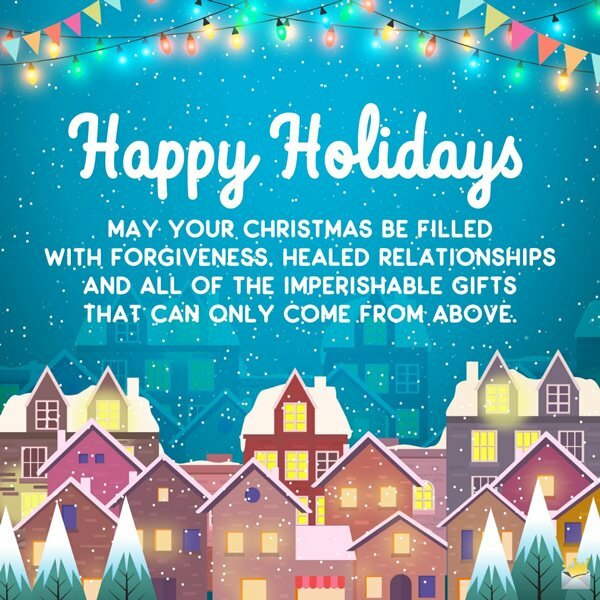 Here you will find a big collection of highly religious Christmas wishes and greetings you can use in making this holiday season truly devout and memorable. May this Christmas bring with it the desire to do charity and the pleasure derived from such charitable acts. May God richly pour down blessings upon you. Happy holidays. May the inevitable joys of this coming Christmas fill your heart with the same type of pleasant anticipation as the Three Wise Men had on their way to meet baby Jesus. I wish you a Christmas in which every gift you give and receive is done so in the true spirit of the holiday. The Wise Men were so because they gave without asking for anything in return, and likewise I wish you a Christmas where the desire to give outweighs the desire to receive. I hope you and your family receive as much hope and laughter this Christmas as Jesus and his loved ones on the day He was born. Even if you find yourself alone this Christmas, may you still find value in the holiday and remember that God loves you, just as He loved Jesus when he was isolated. Happy Christmas. May your Christmas be filled with forgiveness, healed relationships and all the imperishable gifts that can only come from above. Happy Holidays. May your Christmas be filled with forgiveness, healed relationships and all of the imperishable gifts that can only come from above. May you have a selfless Christmas yet be recompensed tenfold for every act of charity you perform. Merry Christmas. This Christmas, may you be covered from head to toe with the mighty blood of Jesus Christ so that any spirit who is even remotely negative would be afraid to come anywhere near you. Merry Christmas. This festive season, it’s my prayer that your focus will be on Jesus Christ, just as He was focused on you during his lifetime. Merry Christmas. 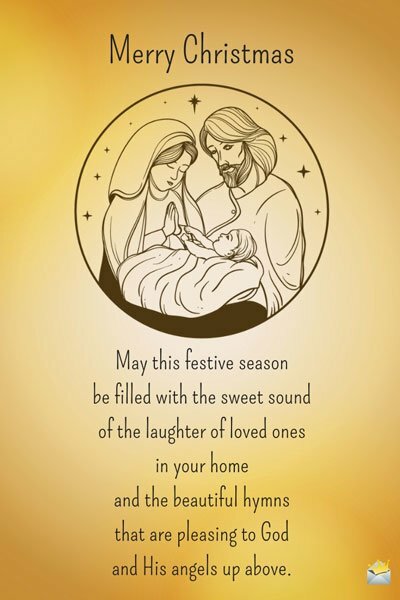 May this festive season be filled with the sweet sound of the laughter of loved ones in your home and the beautiful hymns that are pleasing to God and His angels up above. May the Christmas spirit be so strong in your household this holiday that it even affects the skeptics and nonbelievers who may be therein. Merry Christmas. 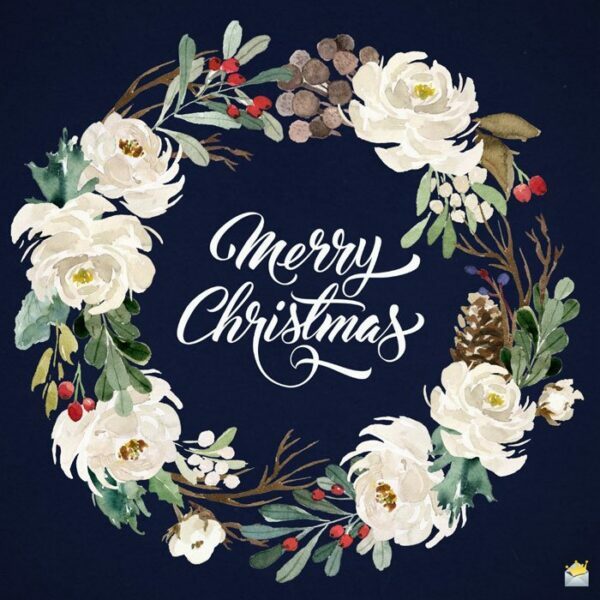 May your Christmas be filled with the sweet sound of the laughter of loved ones in your home and the beautiful hymns that are pleasing to God and His angels up above. May your Christmas be filled with the spirit of Job, who appreciated life even more when he was devoid of everything material. Praying that Christmas in your home will be as the original one, in which the joy was derived from the celebration of life moreso than the gifts presented. Just as Jesus brought joy into the world, may this Christmas serve as the turning point of increased happiness being injected in your life. God came to earth in the form of a man so that we can be saved, and likewise this gift is a symbol of my love for you, not a measurement of it. Happy Christmas. Jesus did not die for a particular religion but for every man, so even though you are of a different faith, I hope you still find joy and merriment during this beautiful Christmas season. 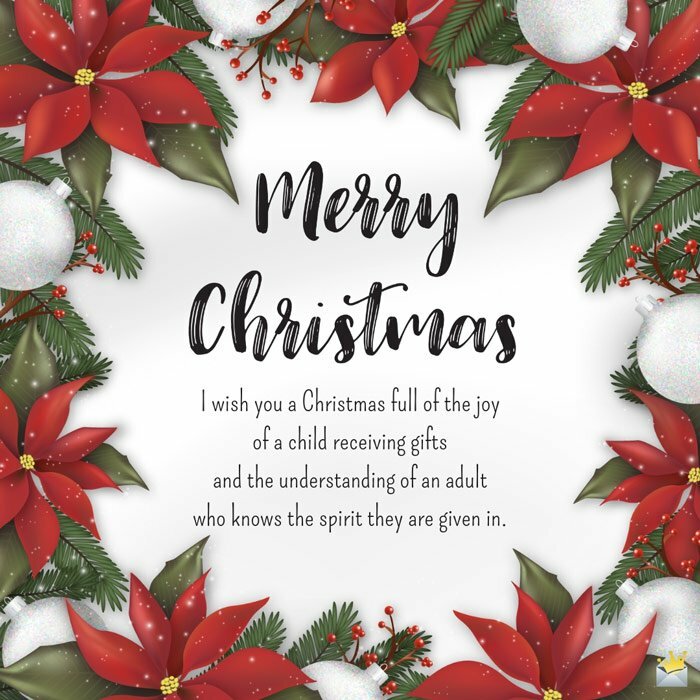 I wish you a Christmas full of the joy of a child receiving gifts but the understanding of an adult who understands the spirit they are given in. I wish you a Christmas full of the joy of a child receiving gifts but the understanding of an adult who knows the spirit they are given in. May you have a Christmas in the true spirit of the holiday, where your gratitude manifests as servitude and every gift you receive came from the heart of the giver. May any gift you receive this Christmas be the type that transcends the boundaries of the physical and penetrates the inner workings of your heart. God bless you and your entire family. May the Holy Spirit dwell in your house and keep it warm and happy. Merry Christmas. May the recipients of the gifts you give this Christmas serve as intermediary beneficiaries between you and God in appreciation for the gift He gave to us in Jesus Christ. Merry Christmas. Christmas is a time when the people who deserve the most, like you, are instead encouraged to give the most. Happy holidays. If Jesus were here today, He would make it His mission to turn our frowns into smiles, but since He isn’t, it is instead our responsibility to do that for others. Merry Christmas. May every gift exchanged this Christmas be so overflowing with love that no one even has to question the true meaning behind the holiday. This holiday season, may you be the Jesus in someone’s life, and if need be may someone else also be Him in yours. Merry Christmas. I wish you a Christmas with the heart of poverty but the resources of a rich man. God bless you, my dear. I hope that your actions this Christmas season serve as a living example to those who doubt its meaning. Happy holidays. May this holiday season conjure up not only pleasant memories of Christmases past but also remembrance of the original Christmas, which has made all of the subsequent ones possible. We are going to celebrate Christmas hard, every year, until Jesus Himself decides to return and shut the party down. Happy holidays! May this Christmas be so enlightening that the ornaments of peace and charity hang on your heart until the next one comes around. Happy holidays. Christmas is a time when we get to officially practice the type of love, unity and charity that will ultimately lead us to Heaven. Happy holidays. I wish you a Merry Christmas free from all criticisms of the holiday but instead just focuses on the righteous meaning thereof. Happy Christmas. This glorious Christmas, may every gift aimed in your direction come with the same spirit of good tidings that the Wise Men bestowed upon baby Jesus. Just as our savior Jesus Christ was able to forgive all of those who did him wrong, I hope this Christmas, you are able to put all past hurts, injustices and strife behind you. Merry Christmas. May your Yuletide be filled with compassion for the less fortunate just as Jesus himself was a servant of the meek and the humble. May the hustles and stresses that have come to define our lives be put on halt this Christmas and instead placed with the unearned benevolence that only God can provide. Wishing you a blessed and very, very joyful Christmas.